Ever considered a cruise for your next trip away? There’s no better time to book that next adventure, thanks to a plethora of exciting new ships set to launch in 2019. Cruise Nation is offering exclusive deals on new launches, with standout features including a 300ft-high observation deck, on-board surfing lessons, a robot-tended bar, a Cirque du Soleil circus show, and an open-air cinema for movies under the stars. Today’s cruise ship holidays are a world away from the stereotypical image of elderly travellers, all-inclusive buffets, and cheesy entertainment. A cruise is a wonderfully, hassle-free, alternative way to experience multiple destinations within one holiday and take part in adventurous excursions or luxuriate with some onboard pampering. 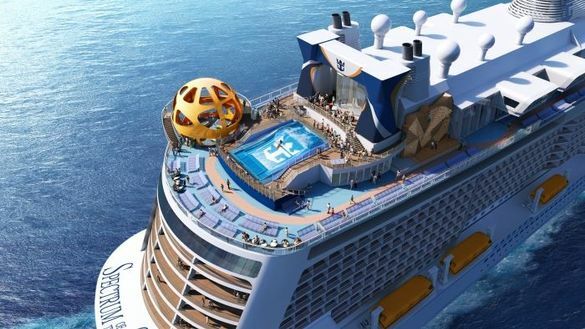 Set to launch on 18th April 2019, Spectrum of the Seas will become the fourth of Royal Caribbean’s popular Quantum Class ships – the most high-tech ships on the seas. With skydiving simulators and surfing lessons, there is plenty for adrenaline junkies to enjoy. Unique features also include North Star, a 300ft-high observation pod offering incredible panoramic views, and the Bionic Bar, with robot servers whipping up delectable cocktails. Best of Japan: Cruise Nation offers a full-board seven-night cruise, calling at Shanghai, Kyoto, Kobe, and Tokyo, and a two-night stay in Shanghai from £1,399 per person. Departing 3 June 2019. For further details or to book, call 0800 073 6512 or visit www.cruisenation.com and search Smart Code 1357605. Princess’ Royal Class ships have been delighting guests all over the world for years, and Sky Princess is set to be even bigger and better when it joins the fleet on 20 October 2019. The ship boasts unique features including a three-deck-high Piazza atrium and an open-air cinema. Caribbean Skies: Cruise Nation offers a full-board 10-night cruise, calling at Fort Lauderdale, Grand Cayman, Bay Islands, Belize City, and Cozumel, and a three-night stay in Fort Lauderdale from £1,099 per person. Departing 15 January 2020. For further details or to book, call 0800 073 6512 or visit www.cruisenation.com and search Smart Code 1354029. A tribute to Italian style and warmth, Costa launches Smeralda on 4 November 2019. The ship is inspired by the “Bel Paese” of Italy; as you walk down the wide staircase you’ll feel as though you’re being transformed to the Piazza di Spagna and browsing through shops, bars and restaurants. Thanks to a liquefied natural gas (LNG) combustion system, Smeralda is at the forefront of environmental protection and is one of the cleanest cruise ships in the world. Mediterranean Mixture: Cruise Nation offers a full-board nine-night cruise, calling at Barcelona, Palma de Mallorca, Civitavecchia, La Spezia, Savona, and Marseille, and a two-night stay in Barcelona from £499 per person. Departing 7 December 2019. For further details or to book, call 0800 073 6512 or visit www.cruisenation.com and search Smart Code 1353303. Cruise Nation is an award-winning tour operator which aims to make cruising affordable for everyone, whether you’re an established cruise passenger or new-to-cruise. The Cruise Nation team has over 50 years’ experience in the travel industry and pride themselves on creating cruise packages for an exciting range of destinations to suit all schedules, budgets and interests. With their unique Smart Packages, customers can expect exclusive deals at unbeatable prices, including flights from regional airports and free hotel stays for more than just a cruise holiday.